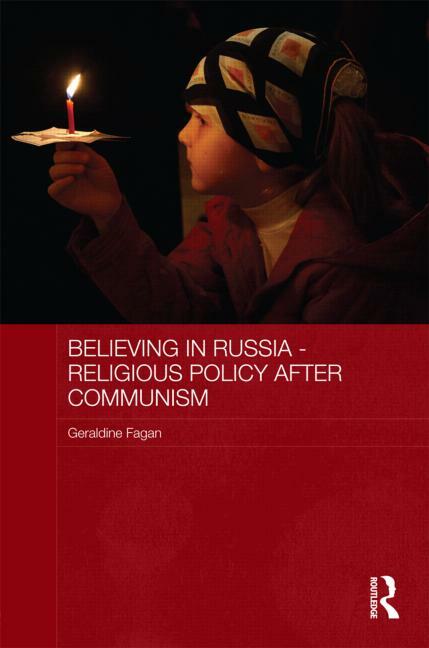 This October, Routledge will publish Believing in Russia – Religious Policy After Communism by Geraldine Fagan (Moscow correspondent for Forum 18 News). The publisher’s description follows. This book presents a comprehensive overview of religious policy in Russia since the end of the communist regime, exposing many of the ambiguities and uncertainties about the position of religion in Russian life. It reveals how religious freedom in Russia has, contrary to the widely held view, a long tradition, and how the leading religious institutions in Russia today, including especially the Russian Orthodox Church but also Muslim, Jewish and Buddhist establishments, owe a great deal of their special positions to the relationship they had with the former Soviet regime. It examines the resurgence of religious freedom in the years immediately after the end of the Soviet Union, showing how this was subsequently curtailed, but only partially, by the important law of 1997. It discusses the pursuit of privilege for the Russian Orthodox Church and other ‘traditional’ beliefs under presidents Putin and Medvedev, and assesses how far Russian Orthodox Christianity is related to Russian national culture, demonstrating the unresolved nature of the key question, ‘Is Russia to be an Orthodox country with religious minorities or a multi-confessional state?’ It concludes that Russian society’s continuing failure to reach a consensus on the role of religion in public life is destabilising the nation.